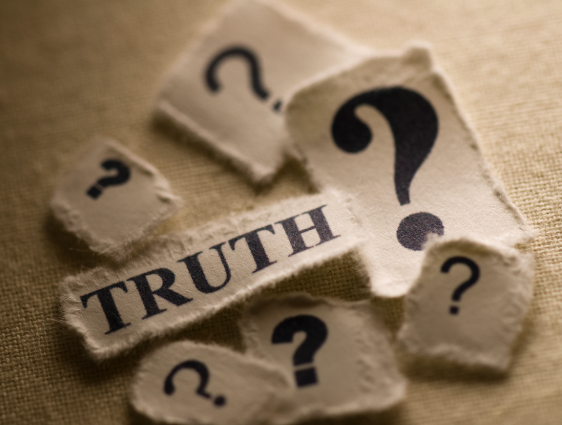 When a witness testifies in court, the oath they take is that they will tell “the truth, the whole truth and nothing but the truth.” “Nothing but the truth” seems to me a repetition of “the truth”, although I’m sure there are lawyers who, for a hefty fee, would explain it to me. But the bit about “the whole truth” seems clear and commendable. If I tell the truth that my neighbour came into the house and sat down, and omit the whole truth by omitting to add that before sitting, he stabbed his brother, failure to tell the whole truth degrades and distorts my whole story. We’re familiar in this corner of the world with people speaking the partial truth, and flying into a rage if anyone tries to add something to make the whole truth. I’ve found myself in that situation more than once, when I tried to include a full picture of particular incidents during the Troubles. Horror! Disgusting! How disrespectful! Keep the story the way it is and don’t dare include that significant detail: it might change the way we want people to think about the incident. You also get the partiality thing in the names of places and institutions here. “Radio Ulster”, for example, is a truthful description of the people to whom the radio broadcasts – but it doesn’t tell the whole truth, because that radio station has no interest in broadcasting to three of the nine counties in Ulster. Likewise Ulster University: ask some of the top brass in that institution whether it is designed to cater for the needs of students in Donegal, Monaghan and Cavan, and stand by for some confusing double-talk. Likewise with those who talk about “the Province” when they mean two-thirds of the province of Ulster; and yet these same people get tetchy with people who talk about “the north of Ireland” instead of “Northern Ireland.” And were you to use the geographically accurate “North-eastern Ireland”, you’d risk a verbal knee to the groin. So I’m suspending judgement about events in Venezuela. I know that the US, the EU and Britain have all condemned the elected president of that country and are backing the opposition leader Juan Guaido, who has declared himself interim president. I know that a general election was due in that country next year but has now been moved forward to this year. I know that our nightly news bulletins, when taking a break from Brexit, show us masses of people marching in protest against Maduro’s leadership. However, you rarely hear that to declare yourself president when not elected is normally described as a coup. I have seen on social media film showing masses of Maduro supporters marching, along with an explanation of Maduro’s proposed radical changes to the country, which if true actually sound perfectly democratic. But maybe Maduro is a dictator. Maybe it would be good if he were replaced by someone else. However, the West has a bad track-record when it comes to telling other countries how to conduct themselves: Korea, Vietnam, Iraq, Afghanistan, Libya – none of these was left in a happier state than before the West’s intervention. The whole truth is an inconvenient truth, because it insists that there may be two or more sides to a situation, and if you accepted that, it’d t mean you’d have to think in a consistently honest way. And who wants to be bothered with that?